Ugh, have I mentioned that I am NOT a fan of this new upgrade on my photo editing program! I hate it! It is difficult to navigate and utilize. And yes, that has kept me from sharing. I spend more time using this new improved program, then I do creating a craft. And that is awful! Especially since I spend anywhere from 2-3 hours to complete projects. I don't have this kind of time to sit and click, and click, and search, and click some more to be at the beginning. UGH! Anyways, I created a card for a current challenge and wanted to take a quick photo, edit it, upload it, and move on with my day. Now that I have been up for 4hrs 'working' on this. . . I am DONE! Mojo Monday Card Sketch challenge has a very creative sketch that I just couldn't wait to work with. 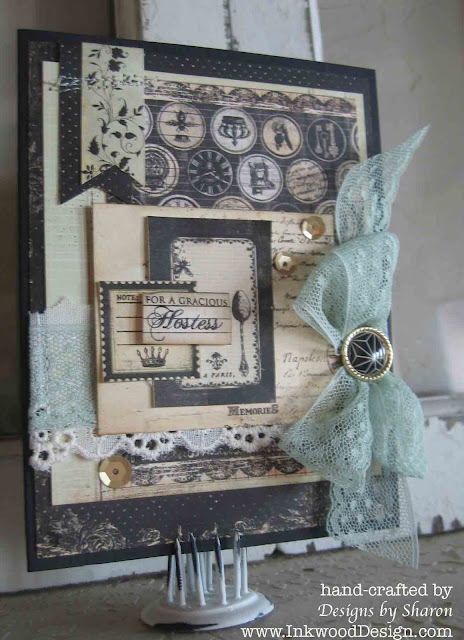 Recipe: My card base is Cream card stock by Paper Trey Ink. I just love the heavy weight of this card stock for card bases. LOVE IT! I also broke open a package of decorative brads by Spare Parts - Deer Assortment. I used the 'gem' brad to secure my lace bow to the card front. I sprinkled on some gold sequins by Studio Calico. And what card wouldn't be complete without some machine stitching and beautiful trims! Yes, I added some beautiful cotton trim (left over from an earlier project), and some mint lace by Stampin' Up!. I almost forgot! I hand-stamped my sentiment onto a scrap piece of the pattern paper in basic black classic ink, by Stampin' Up!. I used the Text Style mixed messages stamp set by Paper Trey Ink. I used foam tape to 'lift' the sentiment off the card. Well, I need to get out on the road this morning and run 6 miles. My training hasn't stopped. I have 3 more races this summer: a 10K, and 2 half-marathons. So, I need to get out there before the temp reaches 85. Because then its just brutal. Thank you so much for stopping by. I promise, I will get the hang of this updated photo editing program before the summer ends. (fingers crossed) Ugh, and now I have a pop up to upgrade by blogger. I think I will pass. Labels: card, deer assortment, hostess, mojo monday, Paper Trey Ink, Prima, printery, spare parts, text style. Oh, this is so beautiful. Love that lace trim. So sorry to hear your photo editing software is being a pain. Thanks for joining us for Mojo Monday!